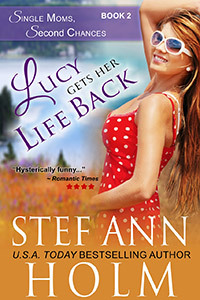 Arriving in Red Duck, Idaho, with recipes, ambition, a silent prayer and two teenage boys, Lucy Carpenter plans to cook her way into the hearts and wallets of celebrities frequenting the nearby ski resort. All she needs is Drew Tolman, former pro baseball player turned local big shot, to put the word out. Soon everyone’s got Lucy’s number, including Drew. But Drew knows he needs more help reconciling with his seventeen year old daughter–following a life-wrecking scandal of his own making–than he needs a personal chef. But as Lucy’s side-dishes of advice and companionship prove even more beneficial than her meals, Drew begins hunting for a way to convince the tempting Lucy that she’s the dessert he’s been saving room for.